This post is sponsored by Overstock. We partner with brands we truly love, so thank you for reading and helping us support them! Natalie and I would describe our interior design style as "modern, minimalism meets eclectic world traveler". Overall, we have a similar aesthetic, but we do have our own preferences: Natalie tends towards earth tones with Asian influences while I tend towards neutrals with unexpected introductions of color and shapes (depending on my mood/hair color/season). 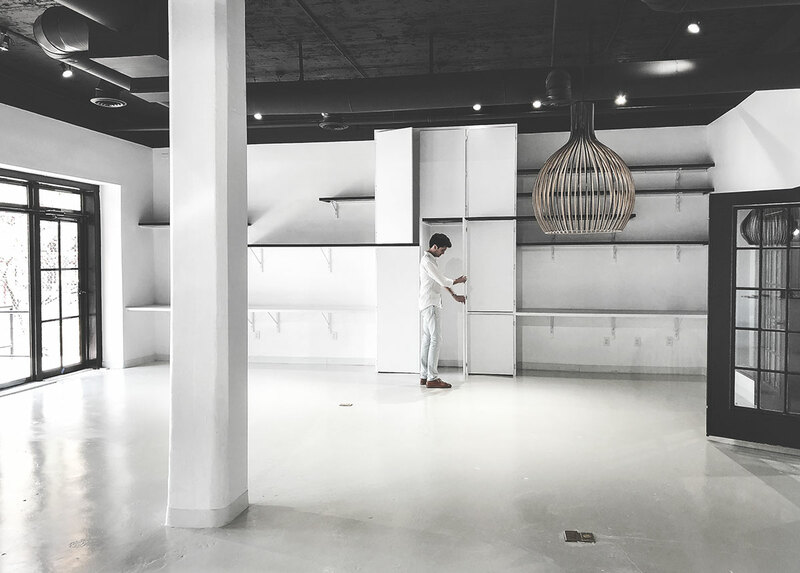 As we planned the finish out details for our headquarters, we easily agreed to stick to our brand's color palette, which has become a part of our WE THE BIRDS identity— black + white. So the finish out choices (i.e. floors, ceiling, walls, countertops, tile, etc) would stay within that simple color scheme. This gives us a backdrop that will stand the test of the time (we have a 5 year lease soooo yeah... that's some time)! When it comes to decor, however, we wanted to have some fun! I think we can all agree that its wayyy easier to buy some new chairs in a few years than it is to replace a countertop or floors. Aside: I had this obsession with the idea of finishing the HQ floors with a dusty pink epoxy, but Natalie talked me off the ledge and helped me realize that would be an expensive commitment to the color pink... so we found other ways to accessorize with pink! Decorating 2000 sqft of open space is no easy feat. We set out to find a partner that could help us complete our vision. Overstock was our absolute first choice! In recent years, Overstock has seriously cornered the market for ALL things home & decor [but its worth mentioning that you can find all kinds of cool things on their site— storage solutions, jewelry, clothing AND even beauty products]. One of the main reasons I love shopping on Overstock is because its a one-stop-shop. Overstock carries a crazy array of different products, so its a literal goldmine for mixing and matching whatever your design style may be. Having the ability to filter by style, color, or size makes it super easy to narrow down your searches based on what you're specifically looking for. We ended up creating extensive wishlists for both our home and our HQ projects on Overstock. These lists made it simple to gather ideas, narrow our selects, and eventually order the items we wanted! 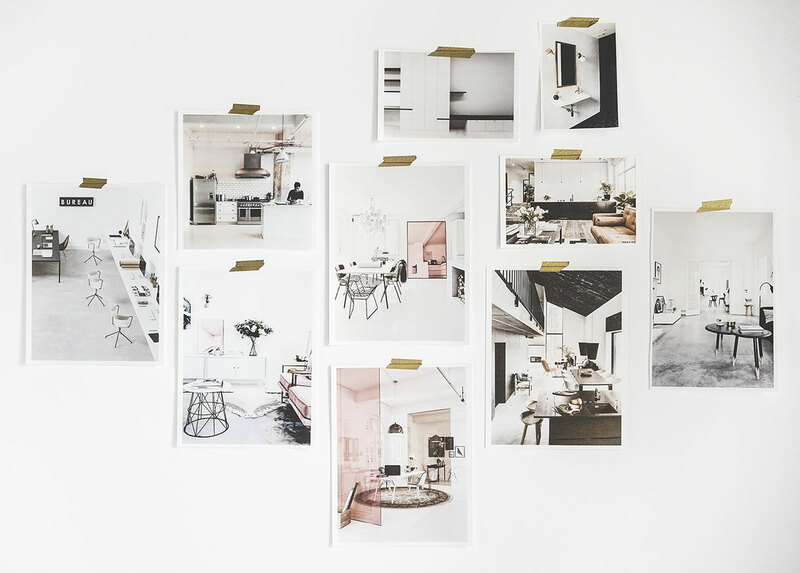 Below you'll find the visual inspiration board we referenced for the finish-out of the headquarters. We've also included our Overstock "HQ Wishlist" with the product links listed below the image for you to shop the items yourself! This post is sponsored by Overstock. All opinions are our own.